John Frieda Sheer Blonde Color Renew Tone Correcting Shampoo helps correct and reverse brassiness and damage from bleaching, giving your blonde hair a boost of shine and brightness. John Frieda Sheer Blonde Colour Renew Tone Correcting Conditioner gives your colour treated or highlighted blonde hair an extra boost of brightness and shine for a salon fresh look. 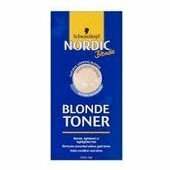 A gentle formula that combines toner and moisturiser to help get rid of unwanted yellow gold tones, and restore natural looking blonde tones.